Very nice watch. This has a functioning, bi-directional slide rule bezel, and the basic calculations I've done with it seem pretty accurate for a watch of this price. The second hand for the stopwatch is the long, centrally mounted second hand, which I prefer, not one of the subdials, like with some cheaper watches. And, when you reset the stopwatch, the minute and second hands quickly return to zero without needing to spin round and round. When I tap on the crystal with my finger, it feels substantial, not cheap or "plasticky." The specs say it has 40mm diameter case, but it "wears" bigger, maybe due to the fact that the metal bezel is so thin, so that the crystal takes up most of the viewing area of the watch, and everything inside the crystal is a similar color. To me, it looks a nice size on the wrist. BEAUTIFUL WATCH. LARGE FACE FAIRLY EASY TO USE. ONE DRAWBACK IS THE 24 HR. HAND DOESN'T KEEP LAPS TIME IN HOURS. IT ONLY MATCHES THE PRESENT TIME. IE. 10:00 PM STANDERED TIME SHOWS UP AS 22;00 HOURS. OTHERWISE A VERY BEAUTIFUL TIME PIECE. WORTH THE MONEY. This is a lovely watch, and I plan on purchasing one as soon as they come back in stock. I had asked customer service how the Tachymeter function worked (the outer movable bezel and adjacent rings), as there are no instructions for that. I have since researched this and have provided them with a document I drafted that outlines how to do time, distance and rate of speed calculations with the watch. I can't wait to lay hands on my own version of this watch, and add it to my extensive collection of other Stauer wristwatches. This watch was out of stock for almost a month; but it was worth the wait! One of my all time favorite Stauer timepieces!It wears a little large on my wrist, but it doesn't matter; I never get tired of looking at quality and value in a great watch! Cool, hip, stylish and very retro. Very pleased with this watch. A very attractive and cool watch reminiscent of what the old aviators wore. However, the bezel DOES NOT MOVE allowing for the functions and calculations it looks like it's capable of. This let me down some, as I am a pilot and it would have been cool if it was capable of calculations. None the less, a cool watch. PRO-A very handsome retro style timepiece, wears well and keeps good time. The band design is very weak at the pins, mine ripped out in 3 weeks.However the customer service lady is very personable and is shipping me out a new band ASAP. The Co-Pilot Watch recalls an era of aerial bravery that will never be forgotten. Soaring over English skies in 1940, Royal Air Force pilots knew they were all that stood between the British people below and the impending Nazi invasion. Day after day, these brave men took their Hurricanes and Spitfires to the air, relying on nothing and no one but their instruments and each other, to engage the invaders, defend their countrymen, and change the course of history by handing Hitler his first defeat of World War II. “Never, in the field of human conflict, was so much owed by so many to so few,” said Winston Churchill. The Co-Pilot Men’s Watch is inspired by what was accomplished in the Battle of Britain. This classic aviation-style watch is not for the faint of heart. 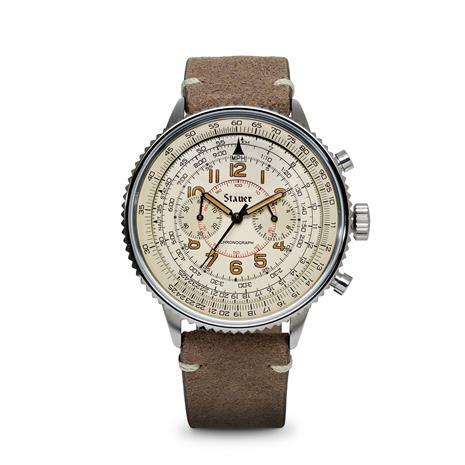 It features markings to calculate velocity, and a stylish sepia-toned dial carrying three classic complications: 24-hour at 3 o’clock and chronograph 60-minute at 9 o’clock. The Co-Pilot’s look is completed by a vintage-style distressed brown leather strap. Those brave pilots flew solo, but their instruments were invaluable. It’s where they looked for confirmation, what they relied on when in trouble. We want our Co-Pilot Men’s Watch to fulfill that role for you, and that’s why we’ve priced it at a low-flying price for a high-flying timepiece.